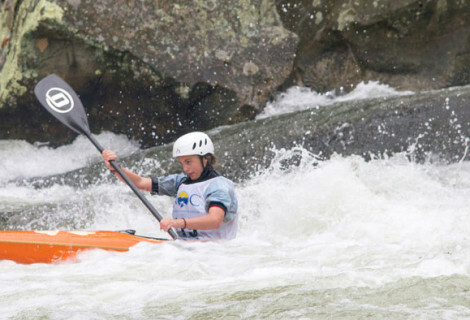 How did you get started kayaking? Honestly, I guess, it was just something new, and I wanted to see what it was. You were doing soccer before, weren’t you? What are you liking about slalom right now? I like the competitiveness. It’s… challenging. I like being on the water. It’s always a learning experience. What does your training look like right now? What I mean is how many times a week do you train, and what kind of things are you doing in your workouts? Right now I’m doing two to three days a week. Over the summer it was four, but about a month ago we cut back a little. We have been doing a Wednesday session at 7:45 am on the lake, which was, well, it was a two-mile sprint. It was not my favorite thing, but it was helpful. Until it ended recently, I’d been helping with NKC on Mondays. Then on Tuesdays and Thursdays we do a 3:30 session at the Bridge Gates. We do lots of short courses, sometimes we do the course for time, and other times we just focus on getting the moves right. What are you most excited about that you are working on on the water? Is there something new that you have recently learned that has been a game-changer for you? Not necessarily new… just kind of improved. I was doing this weird thing where whenever I was taking a stroke on my left side, I would start pulling in before my arm was all the way to the front of the boat, so I would slowly veer left, which was slowing me down. Other than that, there hasn’t necessarily been anything new. 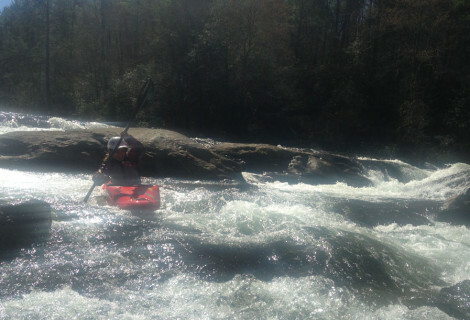 I’ve just been kayaking more, and I’ve been getting better at it. It’s fun when you start getting better, isn’t it? Yeah, I was able to attain up the drop the other day, which was cool. The water was going down, but it was still fairly high, and I was able to get it several times in a row, which felt good. Who are your training partners and coaches? My coach is Lee Leibfarth, and sometimes Allen Mayers, but mostly Lee. Usually I paddle with Evy, and sometimes Max, and Seu. Sometimes we get Lili from Alabama. What do you get out of paddling? 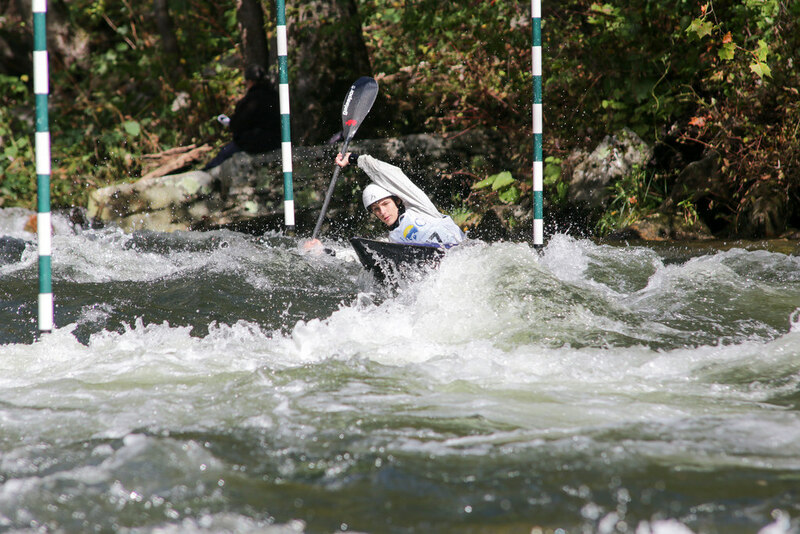 Aside from it being competitive, what do you enjoy about kayaking? I just kind of like being on the water. I’ve always been on the water, since I was a little kid. Not necessarily kayaking, just anything water-related, and I just really like it. The water is one of the best opportunities around here. You already mentioned this a little bit earlier, but I’d be curious to hear aside from your own training, how you’re involved with NRC. I’d particularly like to hear about volunteering as a Junior Instructor with the Kids Club. Well, I volunteered. It was fun to see the new kids learn and get better. Also my sister decided to do it this year, and I wanted to be there to support her. Most of the time I was helping as a demo, showing what was possible and how to do it. I also helped some of the kids who couldn’t really carry their boats, I would carry their boats for them. I also helped some of the kids when they where doing ferries, they didn’t really know where to go and what to do, and I helped with that. Did it make you think about how far you’d come, a little bit, in the last couple of years. Definitely, because I used to be pretty much them, except maybe a little older. So I definitely know what they were going through. Was it fun being there with your sister? Yes, except for that time she lost her shoe and freaked out. I actually like the Charlotte Whitewater Center a lot. The conveyor belt is nice. What about a natural river? What kind of cross training do you plan to do this winter? Well, we’ll start doing our lake paddles in the afternoon when it’s warmer. And maybe occasionally we’ll go to a different state to paddle. I like to ride bikes at Tsali, or just around the neighborhood sometimes. Lee actually showed me this really cool trail. It goes along a ridge, and then there’s this wide open area that eventually links back to the main road. What other hobbies do you like to do? I play games, video games. I also really like to swim. I don’t swim all that often, but I swim at the pool or in the lake. I don’t play soccer anymore all that often. Most of the people that I was playing soccer with just can’t do it anymore or some of them actually moved away. Well, thanks for talking to me Devon. Have fun out there today.